There are different reasons why you may want to read your own water meter. You may want to check how much water you are using. You may be trying to detect a leak. You may need to provide us with a reading so we can send you an accurate bill. Usually your meter will be located close to the front of the property, often just inside the front fence near a garden tap. If you can’t locate your meter, you can call us on 1800 305 066 or log in to Yarra Valley Online Water for more information to help locate the meter on your property. Once you’ve located your meter, read the black numbers from left to right. The numbers in the black and white section represent kilolitres (1000 litres) and the red section represent litres. If you’re sending us your reading for billing purposes, you only need to send the numbers in the black and white section. Both meters below are showing a reading of 538 kilolitres. 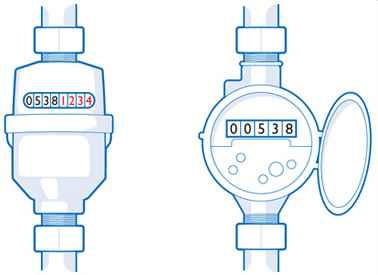 There are many different types of commercial and industrial water meters. Find out how to read a commercial or industrial meter.